Wattblock's Brisbane office is working closely with top Queensland universities to explore sustainability issues in strata buildings. Griffith University students recently published reports on solar PV, battery storage, and electric vehicle recharge in residential strata (see below). The Wattblock internship program started over a year ago with students from the University of NSW assisting Wattblock in delivering its Virtual Energy Assessments Project for the City of Sydney. This year it has expanded into Queensland, and is now in full swing in both states. Students are provided with the opportunity to have a practical contribution to a burgeoning and important industry. Since commencement of the program, the Sydney office has taken on 18 interns from UNSW’s school of Photovoltaic and Renewable Energy Engineering, and two MBA students from the Australian Graduate School of Management. These students contributed work that led to the development of solar energy assessments in Wattblock’s standard reports. 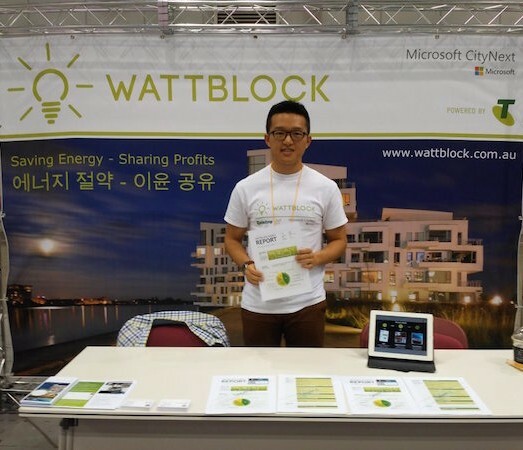 Kevin Moonyong Kim (pictured above) represented Wattblock at a trade convention in Korea in 2015, and has since gone on to do his PhD. The first intake in Queensland included three students from Griffith University, Wattblock’s partner on Advance Queensland’s Knowledge Transfer Partnership. Harrison Pimm, Thomas Crossman, and Grace O’Neill completed their Industry Affiliates Program with Wattblock, with academic supervisor Dr. Prasad Kaparaju. They produced research reports on solar PV, battery storage, and electric vehicle recharge. Click the below links to see summary posters and to download the full research papers. Next semester seven new interns will come on board from Queensland University of Technology and the University of Queensland. Expanding Wattblock’s forward-looking research into areas such as gas and hot water, smart metering, electric vehicles, and energy efficiency in China.